Most horses with sway backs weren't born that way. Most often, they occur because the horse has not been taught how to carry a rider properly. A horse that has a hollow or sway back will carry its head up, with its back concave or 'hollowed.' The horse will typically have a stiff, stumpy gait, and although the neck and head may look elegantly arched, the bend is not correct. Hollow backs can lead to other problems, such as lameness. If the back problem is caused by training, riding, or saddle fit, behavioral problems can occur. It’s important to pinpoint just why a horse is hollow backed. For example, trying to fix a hollow back and high headedness by holding the horse’s head down with a martingale or tie down can lead to all kinds of other problems. Ultimately, some hollow backs can be corrected and some can not. Horses with long backs or sickle hocks will be more likely to be hollow backed. There is also a condition called lordosis in horses, meaning the horse has a defective spine and weakness in the soft tissues that hold the spine and ribs in place. Some horses have malformed vertebrae that allow the spine to sag. This usually happens when the horse is quite young, and there may be signs of it even before the horse is trained to carry a rider. These horses can be ridden if proper attention is given to riding them and finding a saddle that fits comfortably. If your horse has a hollow back, it’s important not to write it off as a conformation fault. A few other things can cause hollow backs that have nothing to do with conformation and can be remedied. One of the most common reasons for a horse hollowing out is cringing away from a poorly-fitting saddle. Saddles can not only cause pain but muscle atrophy and nerve deadening. This is one of the first things that you should look at if your horse is becoming hollow backed. If your horse does not know how to use its hindquarters and instead goes on the forehand, it will probably be traveling with its head up and back hollowed. You need to learn how to ride your horse so that its hindquarters are engaged. 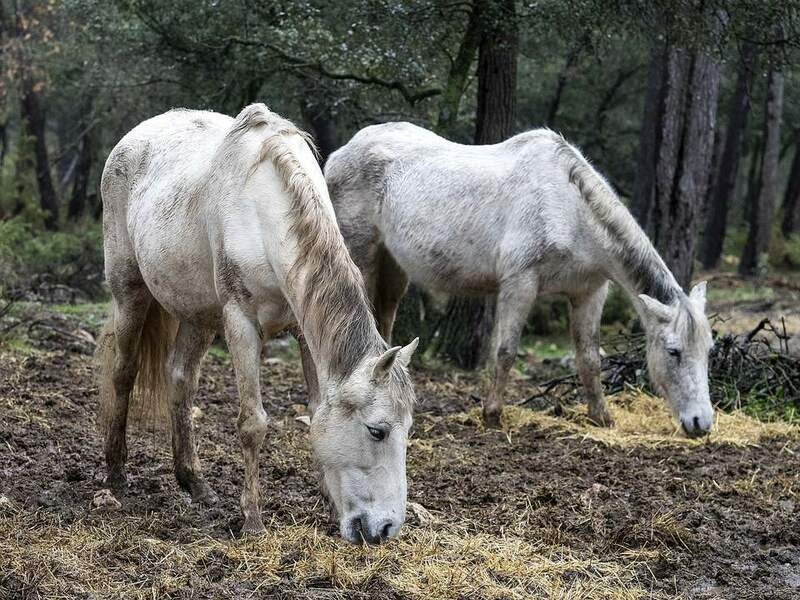 Many call this collection, and although it’s difficult to understand and can be hard to attain, it can ensure that your horse is comfortable and its back will stay strong throughout its life. Even if your horse knows how to use its hindquarters and core muscles to hold up a rider, your riding can counteract any attempt by your horse to carry you well. If you are too heavy for the horse or ride like a sack of potatoes–bouncing and pounding on your horse’s back with every step–your horse will get a sore back, its muscles can weaken, and its back may become hollow. As a horse ages, its muscles weaken. This can lead to the sway back we often associate with old horses. This is just one of the reasons why it's important for a horse to get exercise throughout its life, in order to keep muscles in tone. Lack of muscle at any age can cause a horse's back to hollow out. Like most horse problems, good training and riding will help prevent and may even slightly correct a hollow back. A saddle that fits your horse properly may also help a hollow backed horse. This can take time and may require you to work with a coach for the best results. If the problem is congenital, however, there is little to do but make sure the horse is taught how to carry a rider so its muscles stay strong. There are also ground exercises that can help a horse with a hollow back.